There are two swimming pools, catering for small children with a large terrace area. All meals in the restaurant are buffet style offering authentic cuisine. The hotel is up-to-date in its style and has a classic feel, all rooms have a balcony or terrace for guests to enjoy. First time I came was May last year, it was great, now the food is bad, the beds smell, and you have to rent the fridge, pay a deposit for remote control, the entertainment is rubbish, the female singer is dreadful, not enough sun beds, towels out by nine. Hotel tip: Only one place to eat, take it or leave it, full board but been eating out. My friend and I stayed here in 2012 and we are staying here again this year, we loved the hotel and our room was overlooking the pool and entertainment area, the staff were very friendly and the facilities were very good. The only downside was the food it was a bit disappointing but it was very cheap to eat out so we made the most of it. Our room was spotless and our beds were comfortable. We had a great holiday and would stay here again. I have stayed in this hotel 4 times a year it is fantastic, reception, food, maids, and all the waiters in restaurant are brilliant especially the head waiter and Carlos. I will not stay in any other hotel but thee one only one fault and that's the English with sunbeds round pool. Talk about Germans English are worse. 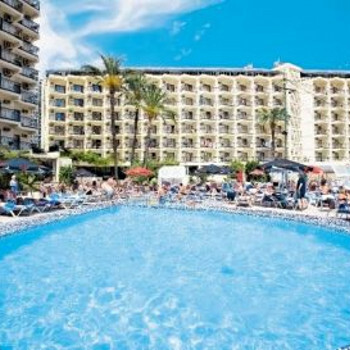 This was our third visit to the hotel, but the first in the summer abd I have to say would not stay at this time of year again, the swimming pool is very crowded and it is impossible to get a sunbed unless you are prepared to queue at the crack of dawn! Hotel is dated but clean. I found some of the reception staff off hand particularly at check-in, I had emailed a request and although I mentioned this on arrival I was totally ignored. Location is slap bang in the busy area. Food was quite good, always found something to eat. Hotel ive been to so many times over the years but i wont say i will not return as i love the location of it .The hotel food was again ok you will no go hungry but there could be more choices. Cleaners to a great job room was kept very clean but could be doing with new bathrooms and a lick of paint in ambassador 1. Staff a hit and a miss this year a know its a not the same hotel manager but the staff on reception are all very grumpy except antonio who always is willing to help . Bar staff are fantastic no problems there ,Restaurant manager makes everyone welcome but again some o the staff could be nicer. Only saw a few acts and tina turner ,bee gees ,rose peters ,neil diamond all ok as prefer going out . Hotel was very clean rooms cleaned on a daily basis with fresh towels daily. Now i try to visit the ambassador 4 times per year and i will say my last visit i didnt think the food was as good not a lot of choices but again always something there to choose salad bar is fantastic. The hotel location is great everything is very close by. Staff are very nice and cant fault them in any way from cleaning staff, bar staff,reception antonio and vincent very nice pasqual in dinning room makes everyone welcome . Entertainment i cant comment on as im out every night but lots on to keep everyone happy summer months much better . Yes i would visit again infact back in 11 wks cant wait .Ive been in every other hotel in that area but always go back to ambassador. Arrived via Resorthopper after getting on the bus 2hrs earlier which I felt was too long, although no problems on the return journey. Stayed here two years ago for new year and most things were the same, no complaints about the hotel except we had a room overlooking the building work of the old Vista Blanca hotel soon to be the Ambassador Sweet and there was a bit of noise from the banging etc. I am fairly fussy with my food so IMO it could have been better but my husband really enjoyed it. Location can't be faulted and the staff are very pleasant. The gala meal on New Years Eve was very good the English had the early sitting at 6.30pm whilst the Spanish had theirs at 9.00pm and everyone seemed to enjoy the entertainment in the two bars afterwards. The hotel is starting to look a bit in need of some refurbishment but if the price is fair nothing to complain about. We are staying here again in October so that says it all I think. Hi all got home saturday 12th september after a week at the ambassador hotel. Ok hotel kept very clean but rooms and bathrooms need updated gettinf very shabby . Hotel food , Again always something to eat but i must admit food has gone downhill turkey legs most nights . But there wasnt a great choice salad bar was good . Location i love thats why i keep going back 4th time this year . Staff i cant fault they all work hard and the waiters are good fun. Entertainment i dont know much about as i never watched any of it . Check in smooth and fast.Hotel is spotless maids clean room everyday.Given a room on the 10th floor fantastic view from the rear.We where given afree upgrade to a 2 bedroom room so missing out on a pool veiw wasn`t to painful.Food was very tasty and always hot,allways found something to eat.Wife used to spa and spoke highly of it.Would not think twice about returning to the ambassador.Never had a problem with the staff or getting sunbeds.Fantastic location beach and nightlife on the doorstep.